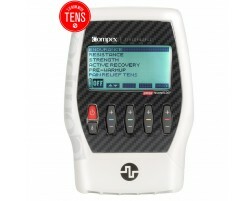 Features 6 Programs (Including TENS); the Compex muscle stimulator for those who engage in frequent competition. Wireless muscle stim device to allow you to train in the gym without getting caught up in the wires. 10 programs to help improve performance and recovery. Features 10 Programs (Including TENS); the top-of-line Compex muscle stimulator for competitive/high performance athletes. Features 4 Programs (Including TENS): the Compex muscle stimulator that helps you achieve your fitness goals.